The new tax law was implemented to generate economic growth and to help businesses by cutting the corporate tax rate from 35% to 21% permanently. Most seniors should see lower taxes in the coming years. The new law will double the standard deduction, which will simplify the tax return process for millions of seniors, who can avoid itemization. Those with fewer deductions can now accept the standard deduction and still receive the lowest tax bill. The Tax Cuts and Jobs Act, signed into law in December 2017 will affect everyone. The new law refurbished tax brackets, eliminated personal exemptions, altered popular deductions, and rebalanced tax credits. Bankrate.com estimates the median household income for Americans over the age of 65 at $40,000, increasing the benefits of the tax changes due to low-income levels. The new law allows senior couples tax-free earnings for the first $26,600 of earned income. 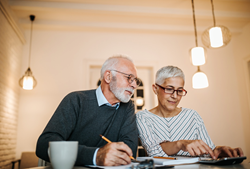 Seniors remaining at higher income levels will see additional benefits because of the changes in the tax brackets and adjustments to the standard deduction. Where Will You Live During Retirement? The new tax law creates caps on state and local tax deductions up to $10,000. In states with high property taxes local taxes can exceed this deduction cap. Seniors living in areas with high property taxes like California, New Jersey, or New York, could lose an important deduction. Moving to a state with lower home values or property taxes would eliminate the penalty. Tax-friendly states with lower taxes include Florida, Nevada, and Texas. Florida is known for the highest percentage of seniors compared to any other state in the nation. Low-cost states can reduce expenses on property taxes, local and state income taxes, and provide a lower overall cost of living. The new law will double the standard deduction, which will simplify the tax return process for millions of seniors, who can avoid itemization. Those with fewer deductions can now accept the standard deduction and still receive the lowest tax bill. The old tax law required most homeowners to itemize taxes to receive the benefit of deducting mortgage interest, property tax deduction and other homeowner benefits. The higher standard deduction will lower taxable income without requiring you to itemize. The standard deduction was $6,350 for single tax filers and $12,700 for joint filers. In 2018, the standard deduction will double to $12,000 for single filers and $24, 000 for married couples filing a joint return. For individuals 65 and older, there is an additional standard deduction of $1,300. Married filers over the age of 65 receive an additional $2,600 deduction. For retirees to benefit from itemizing, deductible expenses must exceed the standard deduction amount. Seniors often face higher medical bills and higher out of pocket costs. For the 2017 and 2018 tax years, the deduction remains at 7.5% of your adjusted gross income (AGI). After that time, the amount required before you can take a medical deduction rises to 10% per AGI. After reaching the 10% threshold, you can deduct additional expenses for your tax return if you itemize. For example, if you earn the median income of $40,000, you can deduct medical expenses above $3,000. Now you can deduct medical expenses above $4,000. Qualified medical expenses include insurance premiums, copays, and medical costs not covered by insurance, including vision, dental, and hearing. In some cases, the IRS allows deductions for a percentage of the entry fees required by qualified senior communities. The National Investment Center for the Seniors Housing and Care found that the average occupancy rate for senior housing properties was 88.1% in 2011 and continues to rise. With more seniors living in retirement communities, they are benefits from the additional deductible. The average healthy 65-year-old couple spends an average of nearly $400,000 on medical costs throughout retirement. Over 25 years, it can average $16,000 annually for medical expenses. Couples with an AGI of $50,000 spending $16,000 on health care could deduct $12,250 from taxable income. AARP determined that most people qualifying for the medical deduction have low incomes and are older. Almost ¾ of individuals 50 and over live with a chronic condition or illness, and 70% of those who use the medical deduction make under $75,000 per year. Individuals with required minimum distributions (RMD) can benefit from the lower tax rates at nearly every income level. The IRS requires everyone who contributed money to a traditional IRA or 401k, to begin withdrawing funds once you turn 70 ½. You pay taxes as earned income on those withdrawals, which affect taxable income. The tax bracket adjustments keep a higher amount of earnings at a lower tax rate. For instance, you can receive up to $9,525 in taxable income and pay only 10% in taxes. Income can rise to $38,700 in taxable income, and you will pay 12% in taxes, a 3% reduction from the old law. Taxable income begins after considering the standard deduction and any social security payments not taxed. This new tax code will adjust for inflation. As inflation-adjusted income from pensions or Social Security payouts rises, the seven income tax brackets should rise in tandem. The Consumer Price Index (CPI), calculates inflation differently than the U.S. Department of Labor, which will determine the inflation adjustments for the tax brackets. Employers tend to rely on the CPI to establish wage inflation adjustments, meaning your pension and Social Security payouts could rise faster than the tax brackets. Congress is currently discussing ways to calculate Social Security payouts that will better reflect the cost of living for seniors. The new tax law was implemented to generate economic growth and to help businesses by cutting the corporate tax rate from 35% to 21% permanently. Between the low taxation of social security income, low capital gains rate on investment income, and the higher standard deduction, most seniors should see lower taxes in the coming years. More seniors will also choose the standard deduction in place of itemizing, except in the event of high medical expenses.